Starting your own freelance business is one of the most rewarding career changes you can make. No longer do you have to sit in traffic to and from the office, work those rigid 9-5 hours, or have to ask your boss to approve your vacation ever again. But all this freedom comes with greater responsibility. You're going to be wearing the hat of the accountant, marketer and sales manager all at once – and that means you're going to need some extra help. Luckily, that doesn't mean you need to hire a team straight off the bat. 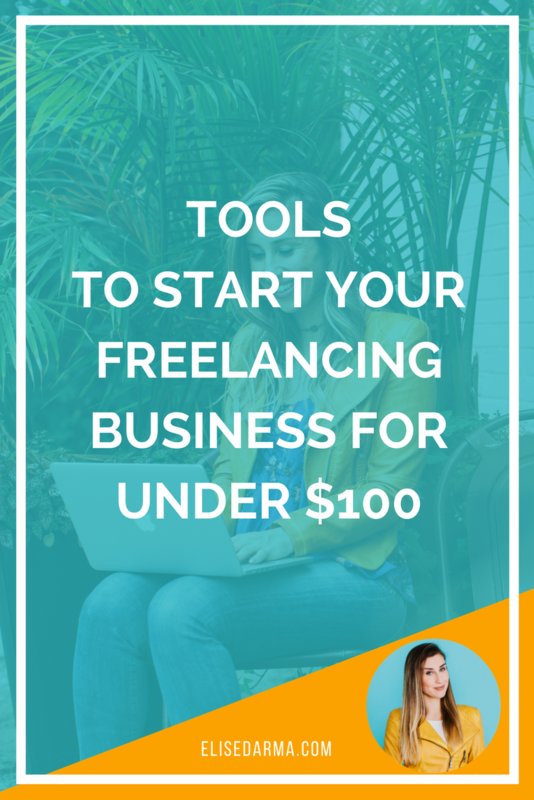 There are tons of tools out there that make running a freelance biz easy and affordable. Well, what if I told you that the tools I used to start my freelancing career way back in 2013 cost me less than $100/month? From balancing my books to managing my workload and even creating a website, I've leveraged a handful of free and paid tools to get my business to its six-figure revenue. So if budget is holding you back from stepping into your #girlboss shoes in 2018, here's how you set up your own freelancing biz that will cost you only $1.60 a day. That's less than your favourite tall, hot and steamy cappuccino from Starbucks. I'll be the first to admit that I'm not the most organised team leader I'd like to be. I've struggled with staying on top of my workload and giving my contractors feedback in a timely fashion. If you can relate to feeling like your never-ending task list is going to swallow you whole - Asana will change your life. It's one of the best group collaboration tools out there. Even better, it won't cost you a cent. Asana is free to use for up to 15 people and comes with all the bells and whistles that will make managing your freelance biz that much easier. Whether you've landed your first paying gig through my Freelance Biz in a Box course or had a client reach out to you through Instagram, you're going to need a contract. I'll admit, the admin side of running a business isn't the most exciting part, but it's a crucial pillar of your success. Thankfully, Hello Sign makes getting organized super easy by allowing you to create PDF contracts and sign them electronically – for free. As soon as you start your biz, you're going to need a place to keep track of money coming in and out. Sure, you could wing your first few jobs without a proper system, but getting into the habit of being organized with your businesses finances will set you up for success in the long run. Wave is the best FREE invoicing, accounting and payment software out there for freelancers. Yep. As long as you are using Wave just for invoicing, accounting and receipt scanning, you can stay on top of your finances without it costing you a dime. One of the goals from when I started taking my freelance biz seriously was growing my mailing list. ...But unfortunately, I waited 3 years to take my business seriously! So I didn't start growing my list until much later in the game. That's why I'm still working towards it in 2018. Because by growing my mailing list, I increase my revenue. The more people that sign up to grab my freebies, the more people I have to share my products and services with. And if Instagram were to shut down tomorrow, at least I'd still have access to my biggest fans no matter what – via their emails. It's because of this that I'm a huge fan of ConvertKit and don't mind paying the $29 each month. Sure, you could use MailChimp for free, but you'll miss out on ConvertKit's better automation features that promote long-term growth with a healthy list, and its higher open rates. This one deserves a spot in every freelancer's toolkit. It's a no-brainer. G Suite allows you to seamlessly stay on top of your email, calendar, create docs, and sync everything to your phone or Google Drive. So whether you're on a plane, working at a coffee shop, or meeting a client, you'll have your most important files and emails only a tap away. The best part? Pricing starts at a measly $5 a month. In the past year, I started offering one-on-one coaching sessions with clients. It's been a fun learning curve, but after helping 11 people launch or grow their business, I've definitely got into the swing of things. One of the tools that helped me keep my coaching calls and appointments organized was Acuity. It integrates with my Google Calendar and lets my clients schedule in their individual slots directly through my website or by an invite link. You can say goodbye to asking "What time works for you?" and making rookie mistakes like double booking yourself. Monthly cost to you? $0. If you want a beautifully designed website without the expense of hiring a graphic designer, Squarespace is the answer. Not only can you choose from dozens of templates, but the backend interface is way more user-friendly then WordPress. It's the perfect solution for non-techies like myself. What's even better is that you can get your own custom domain and hosting sorted for just $12 or $16 a month. Often at the most inconvenient time (ugh, like that time my laptop got stolen in Barcelona for 30 minutes) and that's why as a freelance biz owner, you need to be prepared for those worst case scenarios by having all your data backed up in the cloud. Once you reach the limits of your G Suite storage, you can upgrade your account or move to Dropbox which is what I use now. Dropbox syncs with your computer locally (you can choose which files), manually backing up your files without you having to remember to hit that sync button. So how much does it cost to kickstart your freelance biz? That's a grand total of only $50/month that you need to run a profitable freelance business. So the next time your fear-brain (we all have one) starts speaking up about the ridiculous costs of running a business, tell her that it only takes $1.60 a day to start! Trying to figure out what your niche or offerings should be?